Boynton Beach Historical Society » Schools » School’s out! With today being Palm Beach County’s last day of school, we bring you this wonderful old photo of some students who attended the Boynton High School in its last year of being used as a high school. 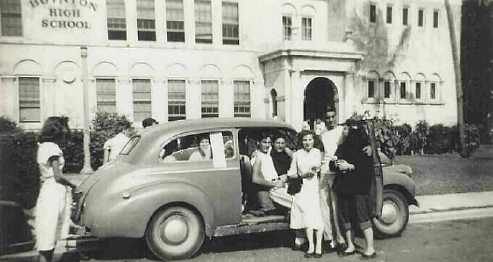 We see the shadow of the coconut palm, the great 1940s era car, and smiling students! The last day of school was as joyful then as it is now. Who can identify the make and model of the car? Tagged Boynton Beach High School, old car, summer vacation. Bookmark the permalink. 3 Responses to School’s out! I can identify some of the people…….from back window, left to right, Jack Sloan, Marvin Baker, Warren Knuth (I think), Eva Brooks Knuth, J.C. Swilley, and Sue Murphy Beaman. That is amazing! Such a great time in Boynton’s history. Eva, Marvin and I graduated in the last graduation class from Boynton High School in 1949.